SFC Refreshment & Ice Cream Parlour serves fresh juices, samosas, ice cream, milk shakes etc. 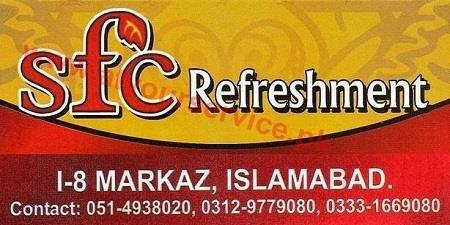 SFC Refreshment & Ice Cream Parlour is located in Twin City Plaza, Tipu Sultan Road, I-8 Markaz, Islamabad. It serves fresh juices, samosas, ice cream, milk shakes etc.